So often, we hear about the learning loss that occurs during the summer from having too much time away from school. As a teacher who has spent 25+ summers at camp, I would like to propose that children who go to summer camp, actually experience just the opposite. 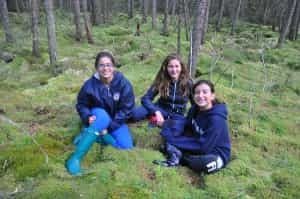 Kids who spend their summer at camp have a learning surplus. 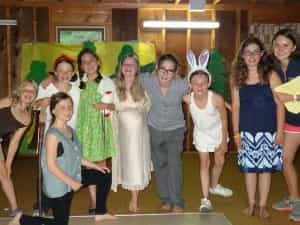 While I do not have any specific data to back this claim, I can share with you my observations from enjoying more than a quarter of a century with kids in the camp environment (including 3 weeks at Camp Woodland this summer!). Math: Friendships formed, skills learned, donuts consumed on Saturday mornings, mosquito bites, laughter and smiles…too many to count! Science: When the outdoors is the classroom, campers learn about the natural environment at every turn. They take hikes in the forest and look for the “stinky” tree, jump on a bed of moss at the Moss Garden, go fishing, visit the bog, search for Lost Lake or the Enchanted Forest, take care of the animals at Farm Zoo, plant flowers and a garden, participate in camp-wide recycling, watch an eagle soar overhead, catch a glimpse of a deer darting into the woods, hear the loons calling to one another across the lake, observe a mother duck and her ducklings swim near the water’s edge, cook over a fire and sleep in a tent while on a canoe trip, gaze at the stars without the interference of city lights, see a full moon blaze its trail across the lake…just to name a few! History: Camp traditions such as Opening Campfire, Gold Rush, Camp Birthday, Olympics, and Banquet are some of the lessons learned as they are passed on from generation to generation of Woodland campers. Government/Leadership: From the youngest to the oldest, all campers are given the opportunity to be leaders during their stay at camp. Cabins take turns being charge of planning various all-camp events, including the Camper Council activity for Friday night and Inspiration Hour on Sunday morning. When an event calls for a station rotation, the girls are responsible for explaining their “game” to each group. The oldest campers are Counselors-in-Training (or CIT’s), and they dedicate an hour each day to leadership training that helps them prepare for their future role as a counselor. 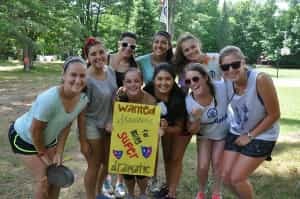 These girls also rotate being “Officer-of-the-Day” (OD) and learn about camp from the administrative perspective as well as assuming responsibilities in activities when counselors have a day off. Language: Writing letters home to family and friends is a favorite rest hour pastime. 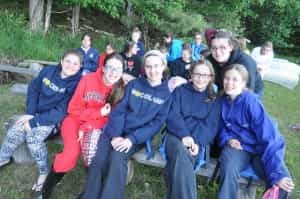 Woodland girls learn about diversity and are exposed to different cultures as campers/staff come from various states and countries. 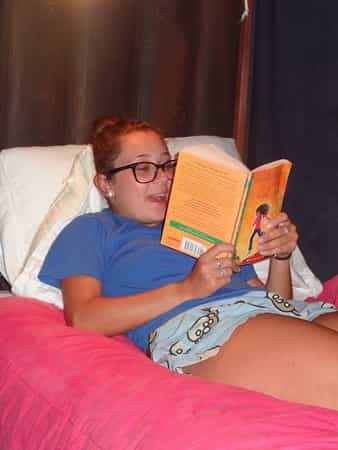 Reading: Campers often read books from home during rest hour or at Rec Swim while sitting on the deck overlooking the beach. Counselors also choose an age-appropriate book and read a story to the entire cabin as part of the nightly routine. Physical Fitness: Camp doesn’t happen sitting down! Campers are playing tennis, doing gymnastics, swimming, sailing, water-skiing, windsurfing/paddle-boarding, canoeing, riding horses, sharpening skills at archery or riflery, dancing, walking to and from activities, running to get their mail, and skipping (just because they can)! Music: The “official” time and a favorite activity is to sing after every evening meal and at weekly campfires. Campers sing “unofficially” while out on a sailboat, during a trail ride, at the start of various activities (“I’m Alive, Alert, Awake, Enthusiastic!”), and just about anywhere and anytime during the camp day. Song Contest is the highlight at the end of the 3rd week; cabins work together and change the words to a popular song and choreograph moves to tell their story of the summer. Performing Arts: Girls have the opportunity to be in dance, gymnastics, and/or drama performances that are put on for the entire camp every 2 weeks; they also act out skits each week at campfires. The girls taking drama also design and build their own sets and utilize the drama closet resources to assemble their costume selections. Put it all together, and the end product is one fabulous production! 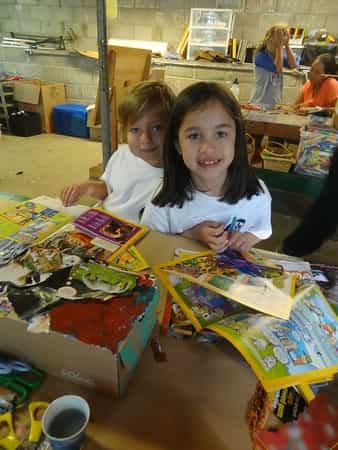 Creative Arts: Imaginations run wild during arts and crafts classes at camp! From memory boxes to crayon prints and bottle decorating, campers are encouraged to be creative and think outside the box with every project. 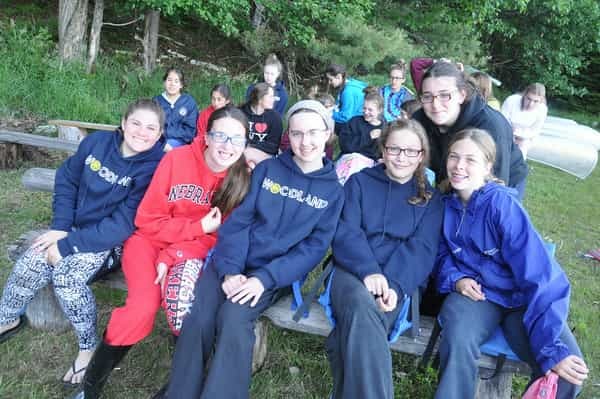 Don’t be surprised if you happen to see a cabin group dressed as “nerds” or wearing a their underwear on the outside of their clothing to assembly – it is all part of the Woodland spirit that is celebrated at any given moment! Health: The Woodland camp community has the luxury of eating 3 well-balanced meals together each day, 7 days a week. Not only is the food delicious, but being able to enjoy a leisurely dining experience in a family setting is a real treat! The cabin bonding that occurs during meals is nourishment for the soul as many stories and accomplishments are shared through conversations within each cabin group. Computer: OK, you got me on this one! This is the only area where there is a deficit (but in a good way)! We are able to accomplish all of the above without one smartphone, laptop, e-reader, TV, or other electronic device. Being “unplugged” for 6 weeks is heavenly, and I highly recommend it! So, as you can see, there is no such thing as learning loss while spending an amazing summer at camp! The typical day at camp is packed with learning experiences that are EVEN BETTER than a typical day at school. And that is coming straight from the keyboard of a math teacher!! !